Extremely tough tire processing equipment is necessary to tackle the preparation and recycling of waste rubber tires. Tire shredders from Vecoplan are superior to other shredders, creating the most value by outputting a cleaner product – a high quality rubber chip product free from wire. An on-site tire re-shredding machine adds value to an existing tire shredding system by adding the capability to generate a wider variety of end products such as mulch and bedding products. Optimal clean rubber processing requires the engineering background and knowledge that only a leading worldwide manufacturer of tire shredding equipment such as Vecoplan can provide. 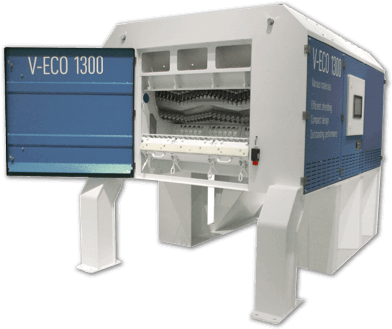 Vecoplan RTR tire re-shredding machines are built to handle the difficult process of re-shredding tires to create tire derived fuel or recycled rubber products. Vecoplan RTR tire shredders actually generate two individual end products – clean rubber, and clean wire – and they do so with the lowest operating cost-per-ton processed in the industry. Vecoplan tire shredders are designed for the removal of steel wire from pre-shredded tires, creating a tire derived fuel (TDF) that is much more desirable. Steel belted tires make up for the majority of tires produced in the U.S. and you need a shredder that you can depend on to process car, truck, and industrial tires faithfully and efficiently. 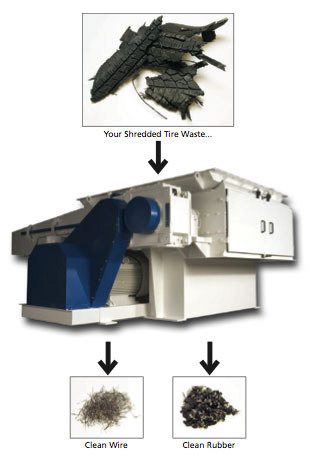 Vecoplan has the tire re-shredder you need that is specifically made to recycle tires. With over 40 years of experience, you can count on Vecoplan as a manufacturer that knows the tire re-shredding business heads above the rest.